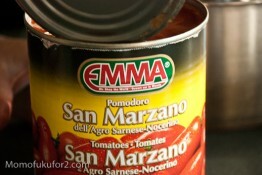 I finally remembered to pick up a can of San Marzanos, an essential ingredient for this three ingredient sauce. 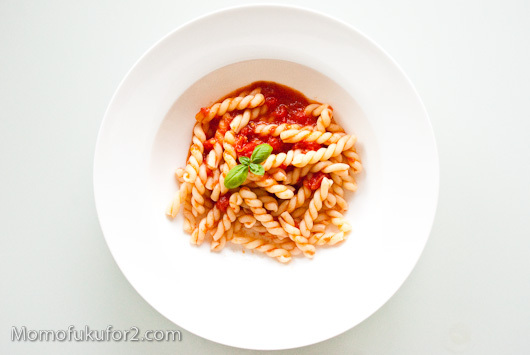 This sauce is one of the easiest pasta sauces I’ve ever made. 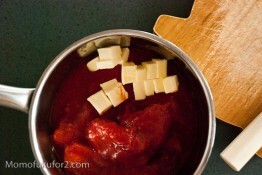 An onion is peeled, halved then put in a pot with a can of whole peeled tomatoes and 5 tablespoons of butter. The whole thing is simmered for about 45 minutes and you’re done! 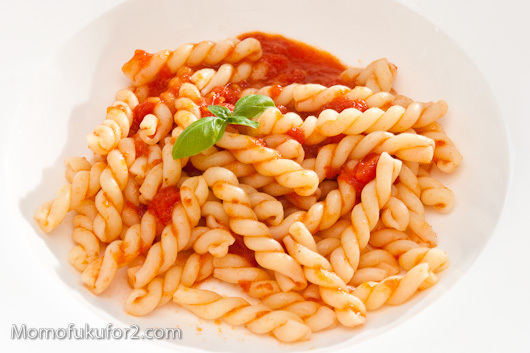 The result is lush, pure and perfect clinging to piping hot pasta. You can really taste the butter in the sauce, which I thought was a good thing. I can see how people think that this sauce isn’t flavourful enough, but I loved that you could taste the individual ingredients playing off each other. Sometimes food should just taste like the ingredients without a bunch of overpowering spices masking flavours. I’m curious though, have any of you ever tried this sauce? What were your thoughts? Serve with your favourite pasta shape. I love it! I always have the ingredients on hand, so it’s a great go-to recipe. Sometimes I add a couple whole, crushed cloves of garlic and take it out at the end with the onion. It adds a little extra something without overpowering the flavors. I’ll have to try the crushed garlic, it sounds like a good addition. I like how you take it out just like the onion. I love this recipe – it’s a standard in our house, though I never discard the onion – just chop it up a bit just before eating. Sometimes I throw some cooked sausage on the mister’s portion, since too many days in a row without meat make him cranky. So, so delicious. I was contemplating eating the onion as well! It looked so melty and delicious. I love this recipe, but especially with Laura’s garlic clove addition and a healthy dose of freshly ground red chili. I use a bay leaf too. Am I f*cking with it too much? I think people adjust recipes to their own taste, so no, of course you’re not messing with it. The sauce is a great base for flavour. The grated carrots intrigue me. I’ll have to look up Batali’s recipe. This is where i got the recipe from…. I’ve made this recipe numerous times! Its a classic that I have now started keeping the ingredients on hand to make on nights when I just don’t feel like putting together an elaborate meal. Yes! I love how simple this dish is, both in flavour and in execution. This is my pasta sauce recipe. I add garlic sometimes, and usually use a purply onion. 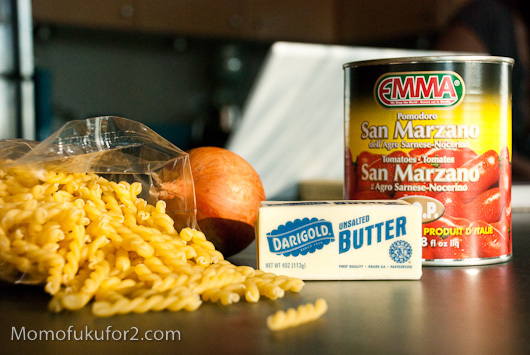 It’s so nice that it is very simple and I frequently add it to homemade pasta. Feels so much better than a box of pasta and a bottle of sauce. It took me a few times to get the taste where I like it. I find that the amount of salt is critical. I’ve also taken to adding a bit of soy sauce. 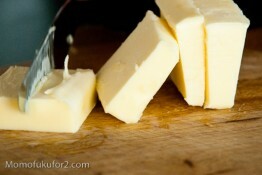 I think salt is key as well, especially since the butter is unsalted. I think my can of tomatoes was unsalted as well as I ended up liberally salting. As for the soy sauce, that’s so funny because I just made a spicy meat sauce with soy that I’ll be posting in a bit. Soy really adds a delicious depth of flavour! I really like to puree this sauce in the blender. 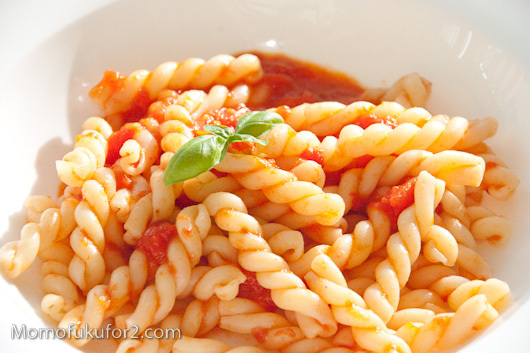 It makes it stick really well to the pasta and gives it an amazing texture. You should try it! Next time I make it, I’ll give it a puree. I’m going to try a longer pasta next time too. I always keep a couple of cans of San Marzanos in the house so I can do this quickly (Trader Joe’s are great and inexpensive). I usually cook with unsalted butter, so sometimes I’ll top it with a bit of parmesan for some saltiness. Delicious. I didn’t try with the parmesan this time, but I’ll have to pick some up for the next go. This sauce was an improvisation of mine when I was just married, never cooked anything, and newly emigrated to the States. It was drawn entirely from my memories of the simple, pure taste of the food I grew up with. I have been making it now for 55 years, once a week or every 10 days. I am so happy and gratified to find it enjoying such broad affection, to find cooks around the world making it who weren’t even born when I first published the recipe. It is dismaying on the other hand to read how some cooks cannot deal with pure flavor and resort to mediate it with garlic, thyme, bay leaf, chili, sausages … It is as though their palates need shock treatment to dispel their numbness. What I used to tell my students is that the genius of Italian cooking is that it is just as important what you leave out as what you put in. A roundabout way of saying less is more. I agree, less is more. Thank you for this recipe; it’s genius is in it’s simplicity. I love this recipe so much. To kick it up even more, I add some heavy cream or creme fraiche to the sauce and stir in cooked pasta. Top with basil, and it’s amazing. I love the simplicity of this recipe. I’ve made it at home several times. My husband likes it a lot, so it’s a great last minute sauce I can make if I don’t feel like heading out to the market. This has become my go-to at-home pasta sauce. It’s stupidly easy, really delicious, and if the onion is at all good quality to begin with, the tomato-y, buttery stewed onions that result are a delicious accompaniment to whatever else we’re eating. I usually scoop up more than my fair share and nibble at them using chopsticks. It’s the perfect utensil for slippery, oddly shaped bits of onion. I love this sauce. I always throw in a halved carrot in with the onion. It imparts the faintest hint of sweetness which sometimes this sauce can lack. Some parmesan on top and wow this makes a good meal. I eat both the onion and carrot separately too. I make this recipe but I have changed it a little to make it easier. I start with tomato ketchup and add water. Then I simmer it in a pot until hot. I skip the onion part but add some onion powder because it’s a little easier. I add some margarine at the end for flavor and there you have it! Probably one of the best authenic italian tomato sauces I make.